There are beer experts, and then there’s Garrett Oliver. 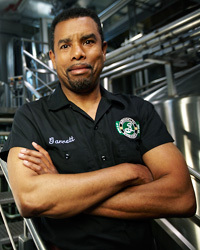 A professional brewer since 1989 and brewmaster of Brooklyn Brewery since 1994, he literally wrote the book on beer—two of them. In both The Brewmaster’s Table and The Oxford Companion to Beer, of which he was editor in chief, Oliver conveys an astonishing quantity of beer arcana and remains at the forefront of American craft brewing. Here, Oliver shares how he got started, how beer is made, how to pair beer with spicy foods, and why it’s a crime more culinary schools don’t include beer in the curriculum. How did you first fall in love with beer? Well, I was in college and of course we drank tons of beer—at least we thought it was beer. It was this fizzy yellow stuff that didn’t taste very good. Then in 1983, I moved to England. I was stage-managing rock bands and going to pubs. I discovered that beer was not this fizzy yellow liquid but was a fascinating array of exceedingly flavorful things, many of which I’d never heard of. I fell in love with the British cask-conditioned ales, sometimes called real ales. Then I went around Europe, to Germany, Belgium, Czechoslovakia. When I got back, I started making beer at home; I had no interest in becoming a beer maker, I just needed something good to drink. The most basic way to describe it is it’s a process where you are taking a grain, usually barley, sprouting or malting it to develop its enzymes, crushing it and mi it with hot water, and activating those enzymes to turn the starches into sugar, called the wort, then fermenting the wort into beer. In modern brewing you’ll add one spice, that spice is hops. Hops are the flowers of the hop plant, a perennial vine. Hops give you bitterness, flavors and aromas. But of course beer is often flavored with almost anything. Within the last year for example, we made a beer based on a cocktail using peat-smoked malt, and giving it an infusion of fresh ginger and organic lemon juice. 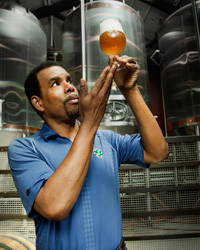 That sort of creative expression is possible in beer, where it’s not really possible in wine. And I say that as someone who considers himself a wine geek. Malts are sprouted and dried barley. We have a wide variety of malts coming from the US, Britain, France, Belgium and Germany. Barley is varietal like wine grapes, so different types of barley taste different. It also depends on where they’re grown, how they’re sprouted and dried. From the most basic type, pale malt, which forms the base of most beers, there are different degrees of roast or caramelization. Malts can be smoked, acidified, all sorts of things. Roasting can give you dark colors and flavors reminiscent of coffee and chocolate. What is the difference between warm- and cold-fermented beer? It’s sort of like saying white wine and red wine—those are the two main families of beer. Generally speaking, ales are warm-fermented and lagers are cold-fermented. Up until about the 1600s, almost all beers were warm-fermented, at roughly around 70 degrees. The Germans and Czechs were at the forefront of cold fermentation, and actually fermented their beers down in caves, often cutting out blocks of ice during the winter, dragging them down into the caves during the summer to ferment closer to 50 degrees or below. Eventually in the 1840s they separated out a whole different species of yeast capable of fermenting at those colder temperatures. The beers took longer to ferment, so they came to be called lagers. “Lager” in German means “to store.” These would be lagered, or stored, for longer periods of time. But the differences between ales and lagers are not what most people think they are. People think lagers are pale and ales are dark. Not true. And that lagers are lighter in alcohol and ales are stronger. Also not true. What is true is there is a flavor difference in general between ales and lagers, and that is because cold fermentation and other things used for lagers tend to taste less fruity. With lager, mostly what you taste is malt and hops. You’re not going to get a lot of fruity characters except some citrus-like hoppy aromatics, but nothing that smells and tastes like peaches and apples and other fruits—whereas those would be common tastes in ales. It doesn’t mean lagers are completely lacking in complexity, but it does tend to mean ales are more complex. Most of the beers in the world today are lagers. They include all the mass-market beers, but also real pilsner, which is snappy, bitter, bright and floral, starting with the original Pilsner Urquell. Another popular lager style is Oktoberfest, which has an amber to brown color, and some caramelized flavor, and bock beers, which are stronger lagers. What are the most important beer styles to know? German and Belgian Styles of Wheat Beer. On hot summer days, wheat beers are the “lawn mower” beers for connoisseurs—they tend to be light on the palate, which is one thing that wheat gives you. Barley has a richer, heavier presence, where wheat tends to be lighter, brighter, a little zing of acid to it. Wheat beers are ales. Typically, they’re made with relatively low amounts of hops, so they aren’t very bitter but tend to be quite fruity. Belgian wheat beers are traditionally spiced with a little orange peel and coriander, and have a lightly spicy, citrus-fruit character that’s refreshing—great with salads and milder cheeses like goat cheese. The higher carbonation that you especially see in Belgian and Belgian-influenced styles gives the beers a particular advantage. Wheat beers often have a slight cloudiness caused by two things: the yeast, which is generally left intact when beer is refermented in the bottle—in German weisse beers in particular the yeast gives you a little flavor—and protein, more so in wheat beers, because wheat has more protein than barley. Among the best of German wheat beers is Schneider-Weisse, which is very traditional with flavors like cloves, bubblegum, smoke and bananas. Weihenstephan is another good one, not quite as good but perfectly nice. We produce our beer, Brooklyner Weisse, in the German wheat beer style. The most famous of the Belgian wheat beers is certainly Hoegaarden, but there are many other great ones. In the US, among the best of the Belgian-style beers is Allagash White from Maine. Stouts provide a dark chocolate, coffee character almost like a cold espresso, especially the stronger imperial stouts, which are great with desserts. A stout is a warm-fermented beer, an ale that contains a very large proportion of malts highly roasted to give the beer an almost black color and an almost bitter, darkly roasted flavor and aroma. People often think stouts are higher in alcohol, but one of the lightest beers available on draught in the US is Guinness, at 3.9 percent to 4.1 percent alcohol by volume, or ABV. Budweiser is 5 percent ABV. People think color is related to strength, but it’s not. The only thing that controls color is whether or not you’ve used roasted malts; the roasted malts don’t make the beer any stronger. There are stronger stouts—they can go as high as 12 percent ABV. Almost every American brewery makes a stout. Brooklyn Brewery’s Black Chocolate Stout is one of our most popular winter beers. It’s in a style known as an imperial stout, because the style was originally developed for Catherine the Great. These are related to stouts but made in a somewhat lighter style. The Smuttynose Brewing Company in Maine makes a very nice porter. At the very high end you have World Wide Stout from Dogfish Head brewery in Delaware. On the West Coast, Anchor Steam makes a good porter, and Sierra Nevada makes a stout that people have been enjoying for a long time. Besides vanilla ice cream, porters and stouts pair well with complimentary flavors like molten chocolate cake, and contrasting flavors like cheesecake. The beer is not sweet—for the same reasons we enjoy coffee with dessert, porters and stouts take the sweetness off the palate, allowing it to relax before giving it another big bomb of sugar. It can be more difficult to pair them with savory foods, because they can taste so strong. But they can be good with steaks, roasted meats and barbecue, anything with a smoked character. I particularly like them with Oaxacan mole sauces with a chocolate base. One pairing that might seem counterintuitive: Many stouts are good with oysters. In Ireland, Guinness and oysters is a classic combination. This is definitely an important range of beers with a lot of very complex, spicy and fruity flavors. In reality, abbey or Trappist beers are not one style, since the abbeys have made their own individualistic styles for centuries, but they tend to be dark, dry, highly carbonated and food-friendly. Some strike on the palate as having sweetness, but that’s really a fruit character, kind of like the sweet fruit of a dry Alsatian Gewürztraminer. Of the paler styles, the most common is called a tripel, which tend to be dark gold in color, with a rum-like, caramel sugar flavor. The classic is Westmalle from Belgium. A related style is the dubbel, which is often fermented with the same yeast strains so it has some flavors in common. Dubbels also have a highly caramelized, almost raisin-like flavor. Tripel is almost always stronger at 8 to 9 percent ABV, where dubbels are closer to 6 to 7 percent. People think the names probably came simply from the number of X’s someone put on a barrel to indicate strength. Dubbels tend to be fruity; two of the best and easiest to find come from Trappist breweries, like Rochefort and Chimay Rouge. This is another increasingly popular Belgian style. It’s generally golden, very dry, bright and fresh, with a relatively hoppy character. Saisons often have a peppery component and go nicely with a broad variety of foods. My favorite is Saison Dupont, but there are many great examples. We make a number of beers either in the saison style or influenced by it; the one people seem to have noticed the most is our Sorachi Ace, named for the Sorachi Ace hop, which has a taste somewhere between lemon and dill. If there were a flagship beer of the American craft-brewing movement, the India Pale Ale or the IPA, would be it. Even though it came from England, it’s the American iteration that people have looked to all over the world. Today you’ll see American-style IPA being produced in Britain, Argentina, Japan, Italy and France. It’s the calling card of American craft brewing because it’s so explosively flavorful. From a brewer’s perspective it’s mostly about hops, but it needs a serious malt backbone. 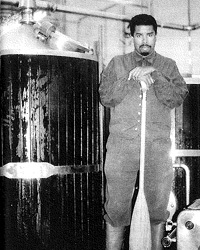 Our Brooklyn East India Pale Ale came out in 1995, one of our first beers. In California, the Russian River Brewing Company’s Pliny the Elder is a famously wonderful IPA. Out of San Diego, Green Flash IPA is also very good. The Pacific Northwest has its own terroir for hops; they now grow dozens of varieties after growing only one type called Cascade. At one point in the early to mid-‘90s, Cascade was almost the flavor of American craft beer. Then people discovered some British hops, and now there are literally dozens of varieties that have been either bred or brought to market. There’s a bit of a split between East Coast and West Coast IPAs: In the West they tend to push the bitterness right out to the edge, and focus on Pacific-Northwest hops, which taste of pine needles and citrus. East Coast IPAs have a bit more malt character and some British hops, which have more fruit character. My favorite international IPA coming out of the American style is probably Jaipur IPA from the Thornbridge Brewery in England. American IPAs are great with spicy foods—Thai, Indian, Sichuan. Complimentary flavors like cilantro and lime juice also go really well. What distinguishes great craft beer from mediocre ones? I think balance is key, and to some extent underrated—balance and a sense of structure. A great beer is like a short story: It has a beginning, middle and an end, and stays interesting throughout. To me, flavor is not a static thing: The taste of beer or food or wine doesn’t occur in a single flash. That’s why for Brewmaster’s Table I wrote my descriptions of the beers in a kinetic style, like sports play, where this happened, then it jumped over that, went to the left, and slid into base—to describe the taste as it happens over time. How do you judge a beer on carbonation as well as aroma and flavor? It’s always about what the brewer intended and what’s appropriate. We make some beers that have relatively low carbonation, especially in British tradition where that’s normal and perhaps you want to accentuate malt flavors that might otherwise be overwhelmed by too much. We also make things that have a champagne-like carbonation and go through a process of refermentation in the bottle similar to méthode champenoise—a process which in fact comes from beer making and only recently came to wine. Almost all beers have some level of carbonation to them. I think there actually is a physical action, a flavor that you get from carbonation. It’s expressed on your palate partly as a type of acidity, carbonic acid, but it also physically scrubs fat and things like that from your palate and allows your palate to reset. How do you pair beer with food? I generally think about the same thing I do with wine: whether I want to compliment or contrast flavors. The nice thing is that beer has a better chance of doing both. Say I have a seared piece of meat or a piece of pancetta, I can contrast it with some carbonation, bitterness or fruitiness. But at the same time, I also have a set of flavors, which I call flavor hooks—the beer flavors that link up specifically with the flavors in the food. So in a dubbel, for example, I have caramel flavors that can grip onto the caramel flavors in the meat. Because the fact of the matter is, beer is far more diverse than wine. And the reason for that is pretty simple: Brewing is much more like cooking than winemaking. Wine is just one ingredient: grapes. That’s it. To a pairing it brings acid, fruit and perhaps some tannin. Beer may be spiced, sour, smoked; it can taste like bananas or flowers or coffee beans or chocolate or chiles. It can contrast or compliment pretty much any food, because our range of flavor is close to infinite. What’s the ideal glassware for beer? Well, as with all glassware, there’s form and function. Part of glassware’s obligation is to be beautiful. However, you have to make sure you can actually taste whatever it is you’re drinking. So if I’m drinking champagne, from a celebratory point of view I might prefer a flute because it’s kind of cool-looking and gives you an automatic feeling that something good has happened. But if you want to write about champagne or taste champagne, a flute is terrible. There’s almost no ability to pick up the nose. Similarly, a straight-sided pint glass is not an aroma-concentrating kind of glass. A beer-tasting glass always has a bowl or bulb to allow aromatics to evaporate off the inside surface—some room to swirl and get your nose in there. It’s nice to have some room for the foam as well. That includes the tulip shape that’s often seen in Belgium. They don’t tend to be as tall in their stems, they otherwise look quite similar to a wine glass, and are flared at the lip. But tasting and drinking are two different things. There are some taller, slenderer, almost flute-like beer glasses that are just nice to drink from, as are pint glasses. What’s the best way to store beer? It depends. Most beers, like most wines, are really ready to drink now. Your average beer has a shelf life between three and six months. It’s not that it’s going to turn sour on the first day of the seventh month, but it will start slowly losing the qualities the brewer wants. However there are a whole range of beers that age extremely well, depending on certain factors. Much has been written on what those factors are. Just like red wines need tannins and white wines need acidity, ageable beers need enough malts and enough fruit. They tend to be stronger and darker. Residual sugar can help. The oldest beer I've ever had was an 1869—it was outstanding. “The pub isn’t just a physical place but a state of mind,” says Oliver. Here, he reveals the top five destinations for a beer lover’s bucket list. READ MORE » Photo courtesy of Garrett Oliver.